At the multiplex, you buy your theatre admission (if you watch cinema in its intended form) for about $10, and you get to seat in a dark auditorium for about 2 hours, in the same way, whether you want to watch entertainment or art cinema. Even though the press treats every film exactly the same way : as products of mass consumption that must entertain, uplift and inspire the widest majority and offend the least... these two types of cinema shall never be confuseable or interchangeable. People do not go watch entertainment like they watch an art film. The motivations, expectations and experience are fundamentally different. A pleasurable night out to watch any entertainment is NOT the effort to track down the only screening of the work of an artist we respect. The expectation of the mainstream audience for a seance of excitment at the risk of wasting 2 hours of your life if it bores you is NOT the expectation of a cinephile who chooses to discover and receive what the artist has prepared. 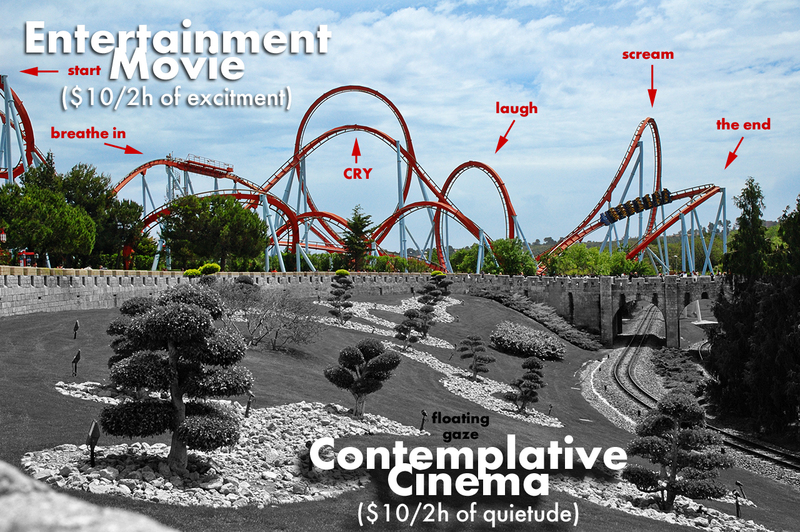 The experience of entertainment consumers like playing a guessing game of what's coming next on screen is NOT the experience of an artfilm lover who waits patiently for the end without keeping the eyes on the watch or the cost-return ratio meter. The press should know better and not put the pressure of commercial imperatives on artfilms which purpose is not to entertain the masses, to capture the zeitgeist, to make mountains of money... NO. Artfilms should be recommended to daring spectators who are not merely seeking to shake off their boredom. Obviously, when you judge a film from the lower side of the image (the "Zen garden") with the criteria of the upper side (roller-coaster) it inevitably fails to meet the expectation of an audience seeking for thrill, distraction, comedy and romance... But is it fair? Conversly if you judge a Hollywood movie (designed to entertain a bored crowd) from the serious criteria of Contemplative Cinema, it won't rank very high, but how often do we hear about that case? Hollywood doesn't create spectacle in opposition to "serious cinema" and CCC doesn't create free-form journeys to do everything Hollywood doesn't do, to be the polar opposite of the classic dramaturgy. They are 2 (of many) incompatible modes of filmmaking, narration and viewing. It doesn't mean they only exist as a negative of the other, they don't need a nemesis to justify their own style. The roller-coaster is a paint-by-number loop circuit, an infinitely reproductible experience, designed to frustrate pleasure until it releases its promised load, surprises are planned by the script in a schemas begging the audience to take position, to make their predictions from a set of predetermined choices offered by the plot cues. That's how these movies are made and that's why people flood en masse to see them, perfectly satisfied of this formated dramatic arc. The "Zen garden" is an open space (within the confine of a feature length film), a journey that is not piloted by assertive editing and directive dialogues, offering a vast environment to a floating gaze, a free observation that could be followed back or forth indifferently, because the narrative is not dependent on consecutive steps to proceed in order. And since the contemplative narration does not impose a deterministic plot, the universe of the film opens up the mind onto wider horizons, outside the screen, outside the film, because the film is bigger than the 2 hours of images present on the reels. Mieders (Austria) Alpine Coaster (YouTube; David J. Ellis; 19 nov 2011) 3'59"
Very nice short film! Thanks for the link. I like the fact the writer (a man of written words) asks "tell me a story" and then what cinema does is not "tell" (with words) but "show" (with images) instead. Quite powerful. Do you mind if I post it here on the blog?